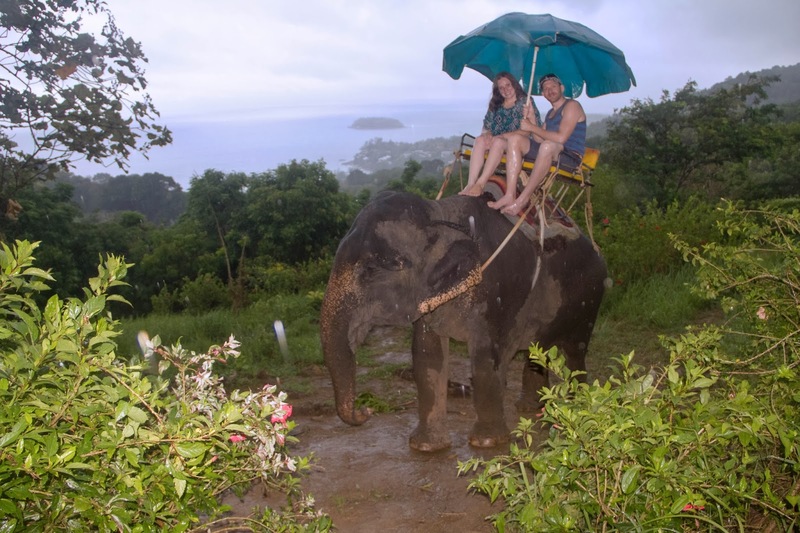 We woke and said, "Hello rainy Phuket"
It's Saturday, the day we had organised to go Elephant Trekking. It's pouring with rain. Should we still go?? Yeah, why not!!! 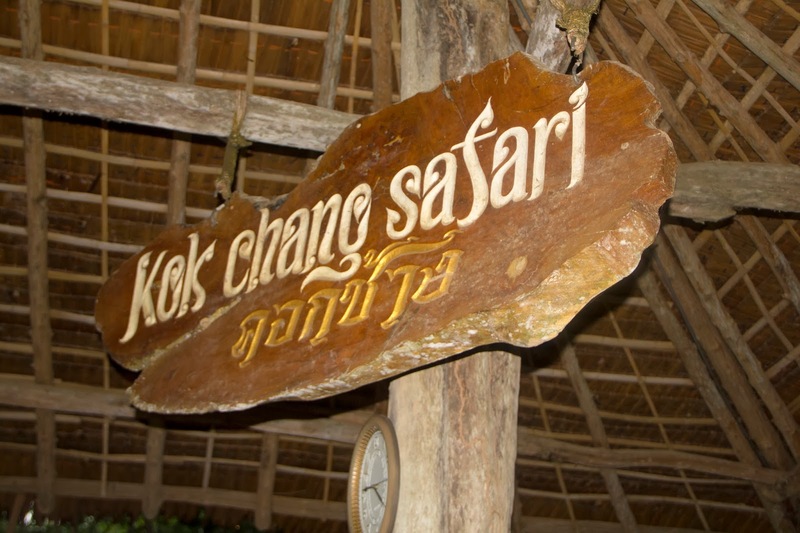 I looked into places to go elephant trekking before going to Thailand and decided that Kok Chang Safari, in the hills of Kata was the one for us. An added bonus was that they picked you up and returned you to your resort FOR FREE, you just have to arrange it 24 hours in advance. We emailed them 2 days before and they emailed back straight away confirming that they would meet us at our resort at our specified time TOO EASY!!! 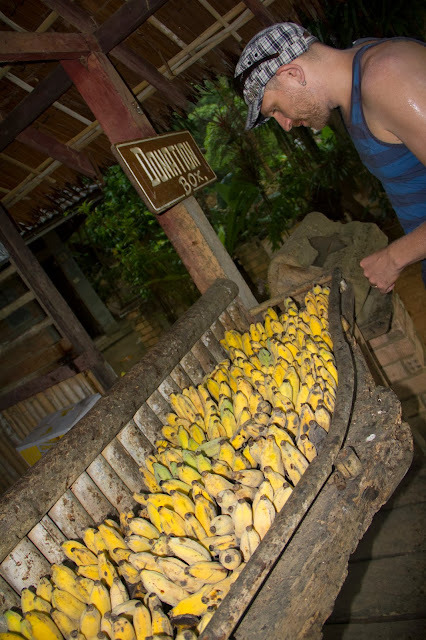 These guys don't advertise, I found them on trip advisor and knew all of these little handy details. It pays to research! As promised they picked us up at 9am and off we went, I was praying that the rain would stop, i'm not a fan of getting rained on!! 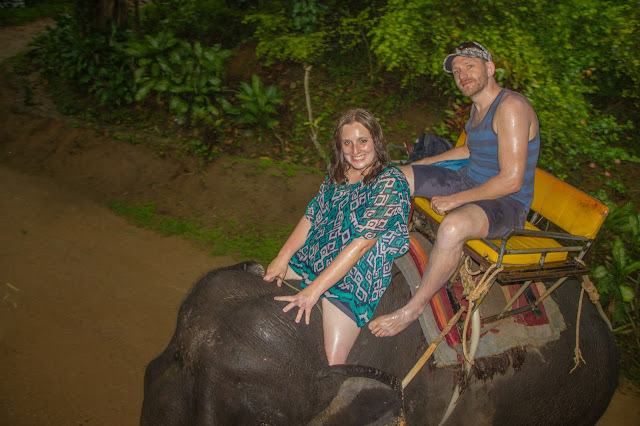 I'd pictured myself riding the elephant, and none of these images included a sopping wet Bec. It's good not to have too many pre-conceived ideas when traveling, I learnt this!! I managed to climb onto the seat without falling off, that was a great start ;) Whooooo let's do this. I had read that some places hit the elephants with pole things, and I was really worried that about seeing this... but it didn't happen! 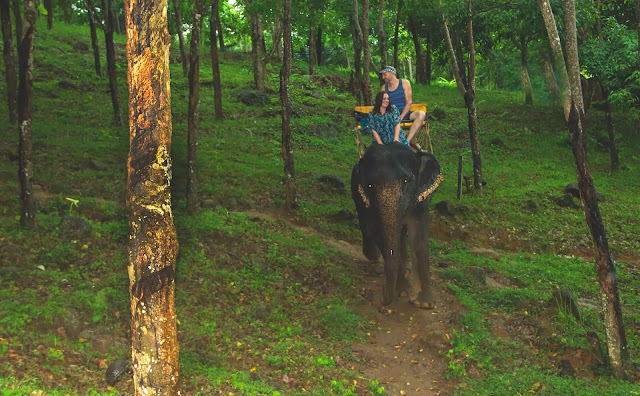 The mahout was really patient. I was so relieved. They treated these elephants really well :) You could tell the mahout genuinely loved the elephant. The scenery at the top of the hill is said to be spectacular. However, it was all grey and clouded over this day. Once we stopped at the top the mahout took my camera and took photos of us... LOTS of photos, SCORE!! You can see our wet, glistening legs in the photos! 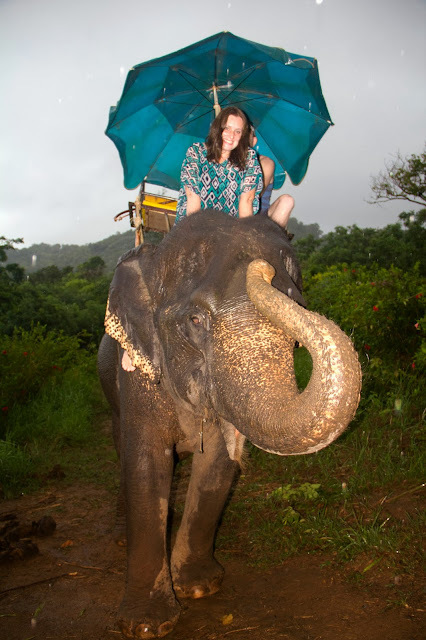 He then let me sit on the elephant's neck for the ride back... this was amazing, this is what I had been waiting for!! To begin with I was so scared. I had nothing to hold onto and I had to really concentrate on not falling off. I was almost certain that I would. I had to tuck my legs in tight behind his ears to keep from falling. It was scary but super special. My little legs tucked in behind his huge ears... Ah I LOVE ELEPHANTS! "It was really surreal sitting up there on an elephant. They are hairy!! They seem very wise also. would swap us over, but he didn't." To my surprise I didnt fall off, not even when we went down the steep hill. I wonder if anyone ever has fallen off?! OUCH! I felt a bit like a Princess. 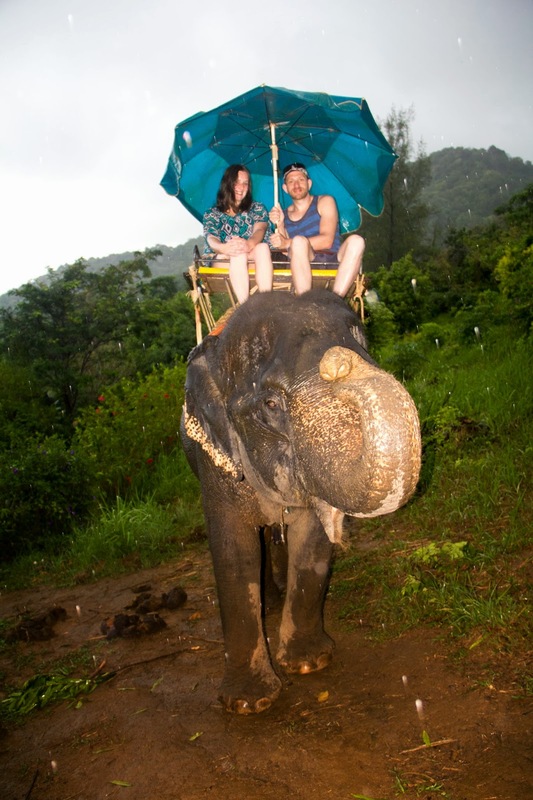 I was sitting up the front of the elephant and Todd was sitting behind me, on the seat, holding the umbrella over me so I wouldn't get rained on. Yes, very princessy. It was so special. Everyone should experience riding bare-necked on an elephant. The Mahout took photos the rest of the trek. An amazing experience to have captured in photo form. He did a good job didnt he? Especially since it was raining. Just like that the 50 minutes were over. We climbed off wet but overjoyed with the experience. I couldn't wait to tell my kiddies about it. 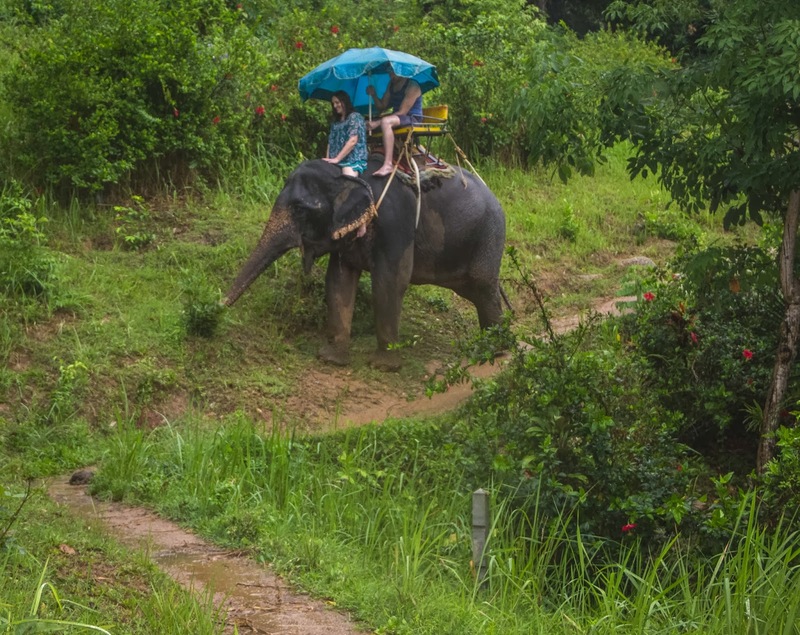 They had told lots of people that their mum and dad were going to ride an elephant in Thailand. I was bursting to look at the photos too! I haven't shown all of them cos they were taken from the wrong angle (from below), double chin alert!!!! The thunder was still rumbling! 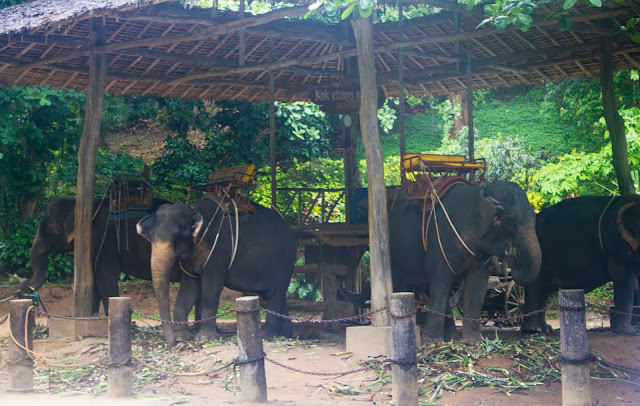 We bought some bananas and had the chance to feed the elephants. These ellies were speed eaters. 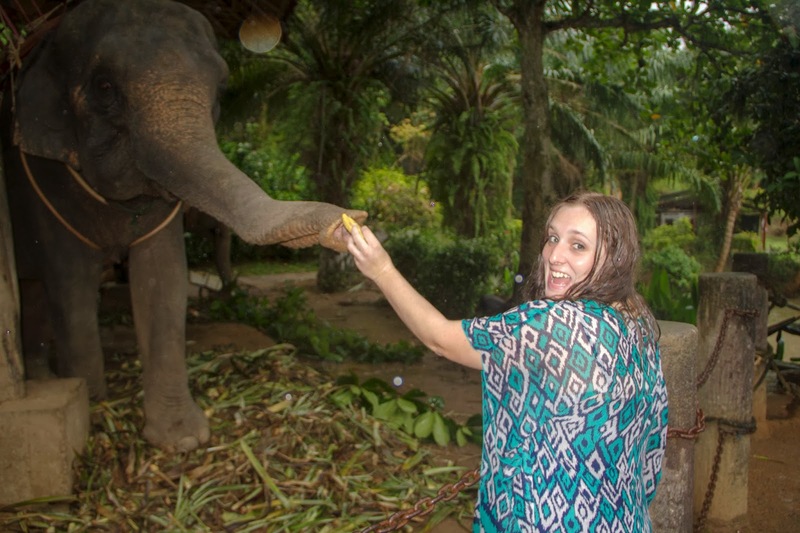 I love how happy I look in the pic of me feeding the Elephant, it's a picture of pure happiness. Me, appreciating and delighting in God's amazing creation, happiness in it's purest form. Yeah I like that thought :) Here I am Philosophising happiness, LOVE IT! Now where were we, oh that's right ELEPHANTS!! 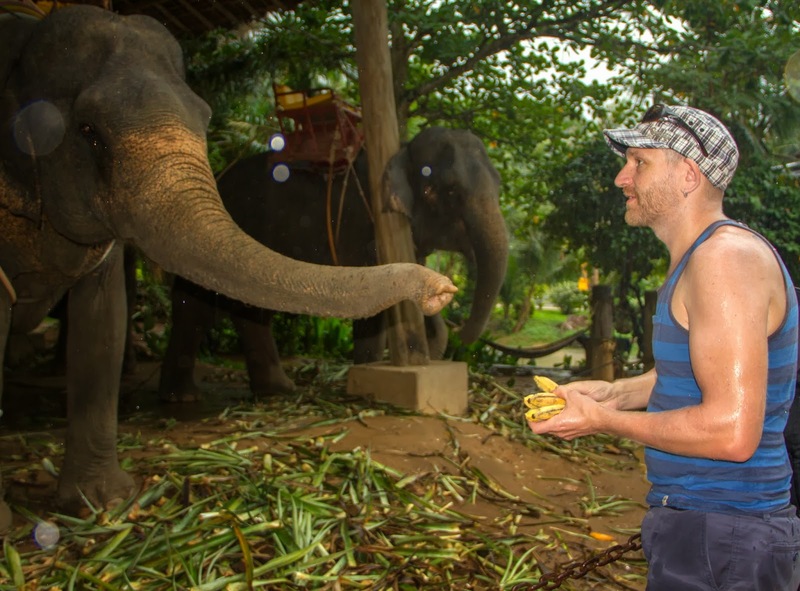 Here's a short clip of Todd feeding the elephants... you can hear the rain. "She was digging her elbows into me- it hurt so bad. She even stood on me at the end and bent my legs in ways they shouldn't be bent- aggghhhhh. It was just horrible. I didnt enjoy it at all. My back is so so so so so sore and tender now. But at least I can say I had a massage in Thailand." I'm not exaggerating, it was awful. I felt like sobbing. My back ended up bruised and that night I couldn't lie on my back, I was in pain and I cried myself to sleep. I was worried that they had done permanent damage. It took a few days for it to feel right again. After that massage Todd booked himself in to get a tattoo the next day, and I totally shocked myself by agreeing to aswell!! I was so surprised that I agreed! Maybe I felt that after surviving that massage I could handle anything!! But I must say, the tat did hurt, but more about that next blog! 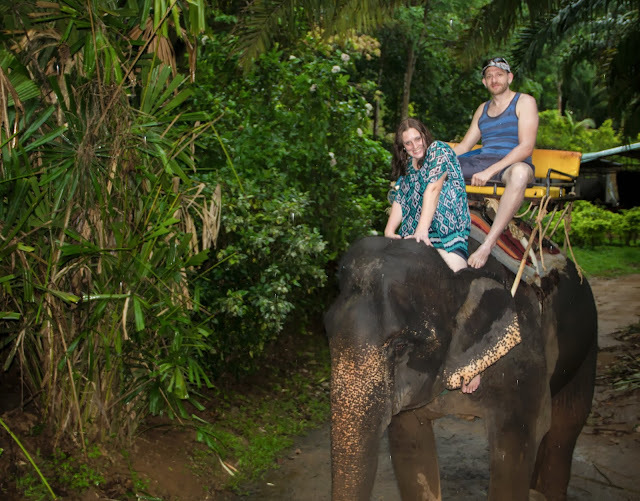 Thanks for reading, and remember riding an elephant is a must. Put it on your bucket list. Total envy! I love elephants! 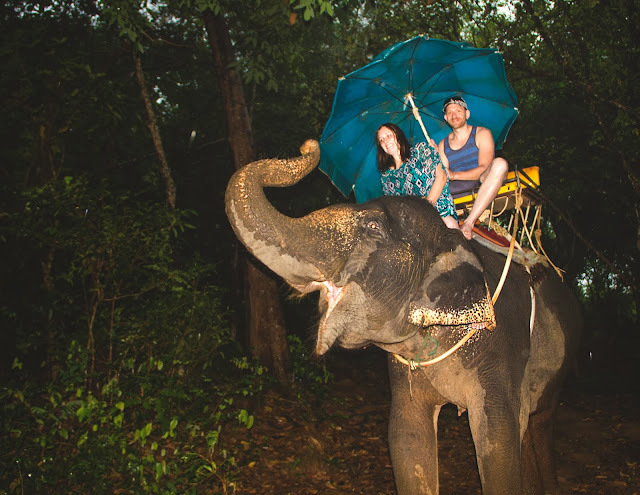 A ride on an elephant in a thunder storm with your sweetheart! What could be better than that? !